Oh nooes! Playing Portal 2 might result in PC Blue Screen of Death! No wonder Portal 2 [$38 on Amazon ] looks so great! Looks like the Valve has some cheeky Mac game developer / designer on the Portal 2 team who sneaked in some Microsoft bashing. 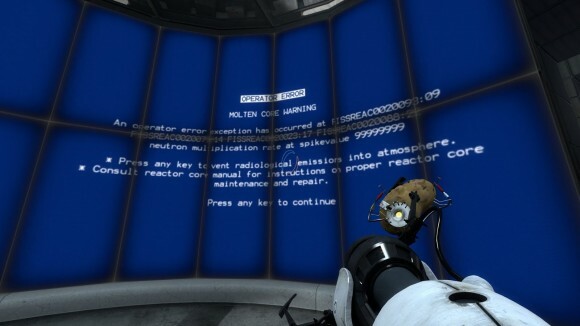 In contrast, there isn’t a spinning beach ball in Portal 2 as far as we know. This entry was posted on Wednesday, April 20th, 2011 at 9:22 pm	and is filed under Apple Art. You can follow any responses to this entry through the RSS 2.0 feed.